I was a bit anxious about not feeling up to the task of teaching today. But as we went over to school I quickly remembered how much I enjoy teaching, particularly math. I love explaining concepts and demonstrating them in ways that help the light bulb come on for kids. Today I was able to do that with adding and subtracting positive and negative integers on a number line. 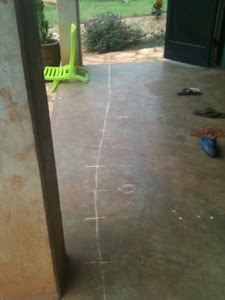 I always like doing this activity with sidewalk chalk so that the students can walk forward and backward on the number line. I was also concerned that I would not be able to talk all day. A thoughtful young woman who is working here as a short term intern offered to cover my afternoon class periods. So I was able to teach all morning until our 1:00 lunch break, then rest my tongue and work on catching up on a month's worth of grading at home. I am so grateful for the way God provided this help, but also gave me a very enjoyable day teaching. I am so thankful for how well today went. I am still struggling with pain while talking and eating, but it seems to be getting a bit better. I am hoping to get a better night's rest tonight. Thank you all for your prayers!